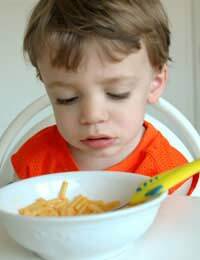 Most children seem to go through the phase of being a picky eater, and if your child is there now then you have our sympathy! You’re probably wondering how long your child can go without becoming malnourished, or whether it can be doing him any good to live solely on baked beans. Be assured that children have an innate sense of what they need and that, despite all your anxieties, they will grow up into healthy young people. You’d probably be surprised if you considered their diet over a week or two. Although on a day to day basis, it may seem erratic, it’s likely to be reasonably balanced over a longer period.There are lots of reasons for children becoming picky eaters; it’s not done to spite you, however you may feel that on occasion! And it’s not because you’re a dreadful cook! Partly it’s to do with becoming characters in their own right, having their own likes and dislikes – and some will be genuine; it’s also their curiosity and their desire to be somewhere else rather than in the high-chair; and it’s the size of their tummies! Little and often is the key, but there are some dos and don’ts too. Do make mealtime a pleasurable experience. Be relaxed. Don’t force food on your child. Try the ‘one spoonful, now another’ approach but when baby is adamant, give up. Do stick to a routine: children like the familiar. Don’t give up on trying new tastes – yes, that contradicts the previous one but children are contrary! Do give children some choice over what they will eat. But don’t let yourself become Head Chef having to cook three or four different meals to suit everyone. Do provide both sit-down meals and in-between snacks. Don’t worry! Your child won’t starve! Buy a plastic tray with individual compartments. In each compartment put a different finger food. Leave the tray where your child can reach it so that as he’s running around, he can stop and help himself when he feels peckish. Leave it easily accessible but cover it with a t-towel to keep flies off. Don’t leave the tray out too long though especially if it’s warm weather. You can vary the ingredients depending on your child’s age and likes. Cut the avocados in half and remove the stones. Scoop out the flesh and put it in a blender along with the rest of the ingredients. Whiz it together to make smooth dip. Drain the chick peas reserving the liquid. Add 3 tablespoons of it to a blender along with the other ingredients. Whiz until smooth. Another way to get nutrients, especially vitamins, into kids who don’t want to sit still is to make smoothies they can drink as they're passing. Peel the mango, cut it in half and remove the stone. Chop the flesh into chunks and put it with the milk and yogurt in the blender. Whiz until smooth. Peel the bananas, orange and kiwi and cut into chunks. Toss them in the blender with the other ingredients. Whiz until smooth.